The network stats show a constant average blocktime of around 17 seconds. Whenever you check it is around 16~18 seconds. 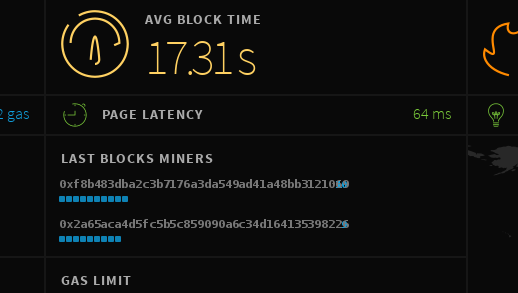 Why is the average block time constantly at around 17 seconds? Due to advances in blockchain research, it was shown that significantly lower block times were possible and perhaps beneficial given the current connectivity of the internet. One of the potential risks of a low block time is a higher rate of orphaned blocks (competing blocks that do not make it into the main chain). To counter this, a GHOST protocol is used which pays for these orphaned blocks (known as uncles), adding to the security of the main chain. Instead of the main chain being "longest", it is instead "heaviest". During the development of Ethereum, several different times and targeting algorithms were tested, eventually settling around 15s. Due to the specific total difficulty calculation used, the actual time between blocks is currently around 17 seconds, however a change scheduled for Homestead will hopefully alter this closer to 15 seconds. This is only proposed as a temporary solution, as Ethereum intends to transition to proof-of-stake, potentially offering near-instant finality. Not the answer you're looking for? Browse other questions tagged consensus network blocks frontier block-interval or ask your own question. What average block time does the Etheruem network try to achieve? What is the safest minimum block time to use without having any problem on Proof-of-Authority consensus? Ethereum's block times are under 10 seconds compared to most other coins which are in minutes. Why and How? What happened to the average blocktime during this period?